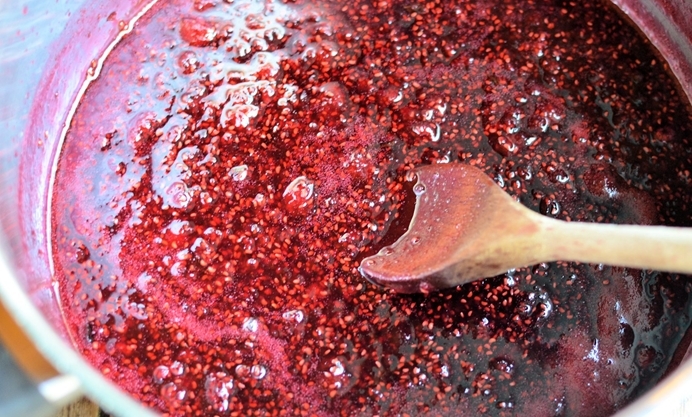 For Karen, raspberry jam is the queen of red fruit jams. In this recipe, she shares her tips for making it extra special. 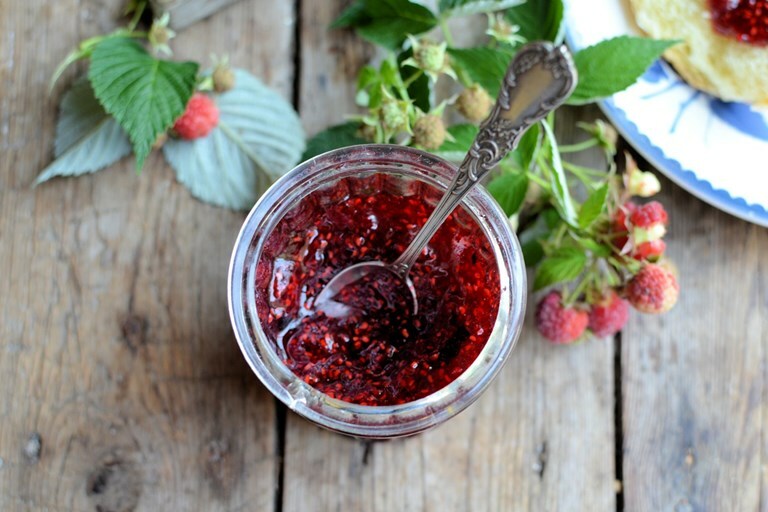 I love raspberry jam and make several batches with my late summer raspberries every year; the glowing jars of ruby preserve are then served at breakfast, as well as saved to be given as gifts at Christmas. 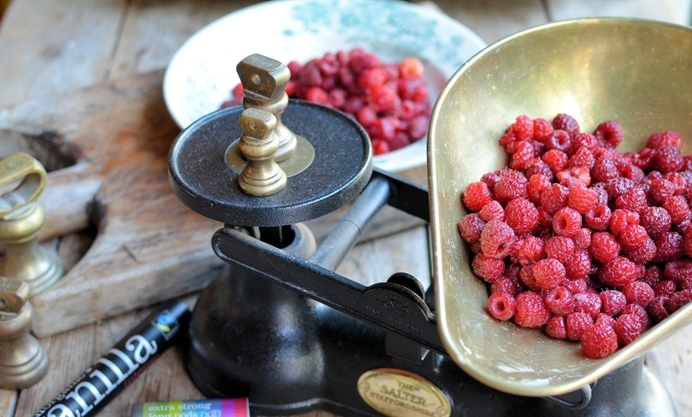 My recipe for raspberry jam is based on my grandmother’s recipe, a high fruit to sugar type with a soft set; however, I also like the more traditional jams with higher sugar content, and they keep much better too. (I think my grandmother had to be fairly thrifty with her sugar rations, a throwback from the war). I was going to share my grandmother’s recipe with you today, but, I have discovered and new ruby gem of a recipe, one that uses organic (Fairtrade) vanilla and was created by the queen of all things jam, Vivien Lloyd.I have tweaked Vivien’s recipe, and she has given me permission to share my amended recipe here – if you want to see the original recipe for Vivien’s jam, you can visit her site here: Vivien’s Raspberry and Vanilla Jam. I did keep with family tradition when I made a batch of this jam recently however, as I used my grandmother’s old kitchen scales to weigh my ingredients, with old fashioned Imperial measures weights too. I love the fact that I have so many tangible links to my families’ culinary past, and the old Salter scales are just one of them. My slightly amended recipe based on Vivien’s is shared below, and if you cannot source good organic vanilla, then the jam is just as delicious without it, although the vanilla adds a wonderful sweet and slightly musky flavour which only enhances the tartness of the raspberries. I find that making smaller batches is more manageable, so make a batch here and there as soon as I have at least 500g of fruit. 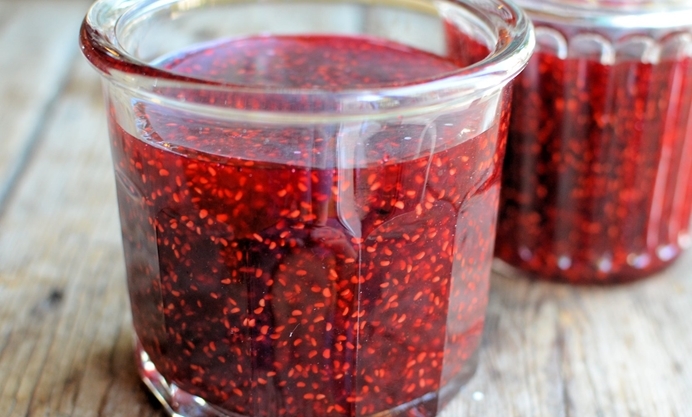 For more preserves recipes, you can see what I have been making here: The Home-Made Jam Factory! Enjoy your jamming session!